One day that was intense, science kept it. One technology is opening the way for another technology innovation. 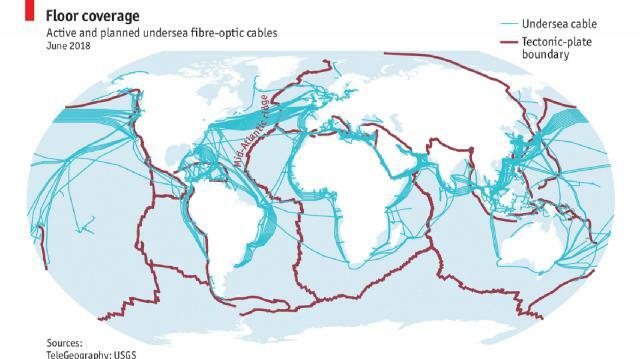 Take the case of submarine cable spreading around the world. Not only the Internet line, researchers can see new possibilities surrounding the submarine cable. They are thinking that the effective way to detect earthquake may be the submarine cable network. The Economist says that the opportunity to surveillance of the world was not before, now at hand. Using artificial satellites, cyclones, volcanic eruptions, and changes in the nature of human activity are now monitored. Over the decades, advanced maps and images were limited to the detectives of the developed and powerful countries, now it has come as close to the hands of everyone like Google Maps. But most of the water in the world is below the water. It is more difficult to monitor what is happening there. The UK's National Physical Laboratory (NPL) researcher Jeussappi Murra gave a new theory. His research article has been published in Science magazine. In that article, using a different structure under the sea, he focused on surveillance on the ocean floor. Marra and his colleagues are suggesting that the use of the 10 million kilometer fiber-optic cable network installed under the sea. Using this network, one can go to the Internet from one continent to another continent. They are talking about using it as a huge submarine sensor. But the researcher Murara's main target is to identify the earthquake. The Economist says that many seismograph tools have been installed in the Earth's ground. But there is a shortage of earthquake measuring sensors under the ocean. A few of the permanent sensors have been installed on the sea level. This means that there are no small earthquakes. Because these earthquakes are gentle, they are not caught in the sensors found in the surface of the distance. The report of the Economist also says that NPL mainly works on measurable economics. In addition to the fiber optic cable connected to other European laboratories. It is used in the synthetic cylinders of the Atomic watch. These cables are placed below the street. Because of this, the word is created in the line due to the movement of the road and the movement of the people, which inevitably interferes with measuring the proper nudge, most of the time it is canceled. Now, the use of this word-shifting technique is to be used by researchers Marra. He proposed using different types of sounds to identify the earthquake. His plan is to send high quality laser beams to the optical fiber in the cable. On the other end, that fiber is connected to another fiber of the same cable, which creates a loop or leash on the return journey. As a result of the near earthquake, when the seismic wave is created somewhere, this laser light will remove something from its state. Inequality or disorder is very small. The equipment that can detect the difference from Femetoscendes will be needed to catch this fine difference. One Femetoscend is one millionth part of a billion. The researcher Murray's idea came in great work. For example, in the year 2016, NPL was able to detect a 6 magnitude earthquake, which hit Central Italy. It can be caught in fiber optic cable. It is found in the Reading Center at Reading Center, London, 79 kilometers from NPL's office. In the year 2017, another test was conducted between 96 kilometers of water under the water between Malta and Sicily. It can hold an earthquake of 3 decimal 4. The epicenter of the quake was 89 kilometers away from the site. Researchers say, the advantage of using only the bottom of the ocean is that the level of noise or noise is reduced. The sound of the background in the cable of Sicily-Malta was insignificant. However, the researchers have not yet tested the long cables completely under the sea. But they hope that when they do research on this, find more uncompromising signals. It is possible to identify the information of many earthquakes that are not caught in the present time. It can be a blessing to geologists. Researchers say there are other uses of their invented methods. Basically this can be the source of any word; Due to the change in the location of dolphins or whales due to gas lyrics, especially in oil or gas exploration. Although the submarine-made submarine can offer only the full data below 70 percent of the world's water, it can be called the real world wide web.